There are two things you should know about me. One is that I come from an Italian background, and the second is that I love to cook. I guess the two go hand in hand really as I had little choice but to learn how to cook “Mama’s” way when I was growing up. I also have a huge family (very Italian I know), but we get on famously, and we all love to cook. Now you know a little bit about me, it might make it easier for you to understand why I started this website which, as you’ve probably gathered is all about cooktops. 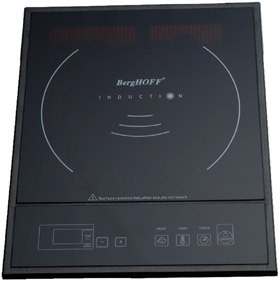 For this particular review, I’m going to share some details (and opinions) on the BergHOFF Touch Screen Induction Cooktop. Before I get into how this cook top works, I think you should know that you’re not limited to just using it in the kitchen. As long as you have a power outlet, it can be used just about anywhere (perfect as an addition or substitute for your barbecue). It also comes in three different sizes: Single, double and extra large. I take this as my first point because for me, safety in the kitchen is everything. I often have kids running about the place and I cook a lot so making sure little fingers don’t get burnt is something that constantly distracts me. What I love about this model is the way in which it uses induction heating. You may not believe it but when it’s switched on the only time you will feel heat is when a pan is sitting on it. In fact, this is what induction is all about. This unit uses technology that will only heat what you’re using to cook in. It won’t heat the unit itself, and it won’t heat up your kitchen. 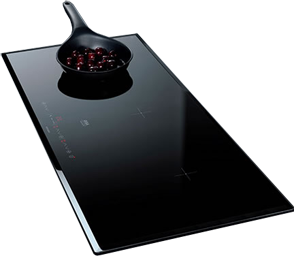 So if you find that you’ve absent mindedly taken a pot off the stove and turned your back for a moment, this cooktop will know what you’re up to. This means if someone does put their hands on it, they won’t get burnt. Because of the technology used, safety isn’t the only thing you don’t have to worry about. At 1600 watts, this cooktop will only use electric when you’re actually cooking. When you take the pan away, it will automatically detect there is nothing to heat and will stop using energy. Personally, I can’t think of a better idea and well done BergHOFF for coming up with it! One important point: You should know this cook top can only be used with induction heat cookware because of the way it works but honestly, this is just a good excuse to buy some brand new pans! All of the controls are touch screen (hence the name) and changing the settings is really simple plus, you have an LED display which is really easy to read. The surface is made from tempered glass and is shatter proof so you don’t have to worry if you drop anything on it. In my opinion, if you’re looking for something to cook on that won’t add additional heat to your kitchen in summer, want an excellent cooking surface when you’re off camping or enjoying your back yard, you can’t go wrong with this cooktop. You may be thinking by now that this “kitchen gadget” will cost you a pretty penny because of the technology used, but when you look at the prices Amazon has to offer, you’ll be pretty surprised.